From the Stands: Let the seniors begin! Editor’s Note: Heather Carrelli, website manager for Tarah Kayne and Danny O’Shea, is writing a blog, on her experiences as a fan at the 2019 U.S. Championships. This is blog number 3. Here are links to read her previous blogs: #1 (Arriving at U.S. Championships), #2 (The Detroit Adventures). Day Four: Thankfully day four of my adventure in Detroit for U.S. Championships did not start with a fire alarm and was only filled with breakfast in the lobby of our hotel. We had a jam packed day full of skating today although we did have a nice break between events to have lunch with two of our friends and that’s something that I’m not used to having when I come to Nationals. Normally the schedule is SO packed that we have to schedule time for some meals, but there are nice breaks in the schedule here that have allowed us some much needed time away from staring at the white ice in the arena. Our day started off with the junior pairs final which was a nicely skated event and featured some promising young pairs teams. The leaders after the short program, Laiken Lockley and Keenan Prochnow, skated a wonderful long program and won the event by quite a large margin. I didn’t know much about this team coming into Detroit, so they were a very pleasant surprise for me. I’m encouraged to see how they do at Junior Worlds this spring. I also enjoyed the silver medalists, Kate Finster and Balazs Nagy, although they had a few rough moments in their long program. They have a nice connection and some solid elements so part of me wonders if some nerves got to them today. Overall, the event was a lot of fun and hopefully these young teams stay together for a while! After the junior pairs final, we had some time to kill before the senior pairs short program so we met up with two of our skating friends and had lunch at Kid Rock’s restaurant in the arena. It was pretty packed in there (and the junior pairs champs and their families were all there celebrating their win, which was fun to see) but we got a table and had a great lunch together chatting about skating and many other topics. I also discovered during this break time that Vanessa James & Morgan Cipres (the pairs team from France, who are one of my favorite teams) had won the European title which made me very happy! The food at Kid Rock’s was very good (I had grilled cheese and tomato soup) and highly recommend them to anyone who’s looking for somewhere to eat between events if you’re attending Nationals this week. Before we headed back to our seats for the next event, I was able to greet Amanda Evora and Jim Peterson, who I’ve known for quite a few years now, so that was nice to wish them luck and get to chat briefly with them. The senior pairs short program was our next event and it did not disappoint me one bit. I am a BIG TIME pair skating fan so this is always my favorite event at Nationals. Confession: Obviously, as Tarah Kayne & Danny O’Shea’s webmaster and having known Tarah and Danny for a number of years, I do have a bias towards them and always root extra hard for their success but my greatest wish for them every time I come to Nationals is that they skate their best and that they’re proud of their performance. Their short program today was one of the BEST that I’ve ever seen from them and after all the injuries and struggles they’ve overcome the last few years, it was WONDERFUL to see them skate with confidence and joy today. I’m so happy that they’re healthy this year! Ashley Cain & Timothy LeDuc also had quite a bit to overcome after her scary fall last month at a competition in Europe so it was fantastic to see them skate a strong short program here. They looked relieved to have gotten through that without major error, so I’m thrilled for them. I have no problem with the top two pairs being separated by a little more than a point, because they were both wonderful. I was also impressed with Haven Denney & Brandon Frazier and Deanna Stellato-Dudek & Nate Bartholomay. They both had rough patches in the fall (Denney with injury and Dudek with illness) so it was really encouraging to see them skate well here. I was also encouraged by Jessica Calalang & Brian Johnson, a new team who had an error in their short program today because they have great skating skills and a nice presence on the ice, and last year’s junior champions, Audrey Lu & Misha Mitrofanov also had a strong short program today. The top six teams were all outstanding which was SO much fun to see! As happy as I am for the top teams is how bummed out I was for Alexa Scimeca Knierim and Chris Knierim when they had an uncharacteristically rough short program today. Their twist was SO big that I think it surprised both of them and then they were a bit shaky through the rest of the program as well. It was heartbreaking to see and I hope they can skate better in the long program on Saturday. Overall, I thought the senior pairs short program was quite strong and I’m looking forward to the pairs final this weekend! The ladies short program event was SO exciting and had some young stars rise up and make their mark on the competition. 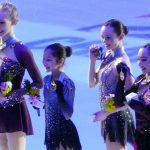 The first youngster to make an impression was 13-year-old Alysa Liu who became only the third woman in history to hit a triple axel at U.S. Championships. She also hit a wonderful triple-triple combination and a beautiful solo triple along with showing solid spins and an infectious energy. She was amazing and I can’t wait to see her in the long program tomorrow night! Another youngster who made her mark was Emmy Ma who skated a beautiful short program and also finds herself in that final group of six to skate for the long program tomorrow. Hanna Harrell is another young name to watch after she skated an incredible short program and ‘Rippon’ jumped her way into that final group. Amber Glenn and Mariah Bell also skated wonderful short programs and will be right in the mix for the medals tomorrow night but the overall night belonged to reigning U.S. champion Bradie Tennell who skated a FABULOUS short program and is the leader going into the final. She has definitely improved her presentation, her spins were solid, and her jumps were spot on. The ladies final promises to be quite the event tomorrow night and I can’t wait to see it! After another great day of skating, I was hoping that my hotel woes would have come to an end but for the second night in a row, our hotel keys didn’t work so we will definitely be having a conversation with the hotel manager about all the troubles we’ve had during our stay and I promise to keep you posted on that front. I’ve never had so much trouble at a hotel for the U.S. Championships and I’ve been attending this competition pretty much every year since 2004, so this is very frustrating. Hopefully things turn around soon! Day five of my week in Detroit is coming up tomorrow with the junior dance final, the senior rhythm dance competition, and the senior ladies final. Thanks once again for reading and I hope you’re enjoying my take on the U.S. Championships this year!